Like Death, the Hangover has regretfully confounded the scientific community in its efforts to develop a satisfactory cure. This fact has not stopped thousands of amateurs from prescribing imaginative remedies, suggesting that hangovers remain less an evil to be vanquished than a fruitful topic of conversation among quaffers, given that they can in fact be avoided simply by not drinking too much. 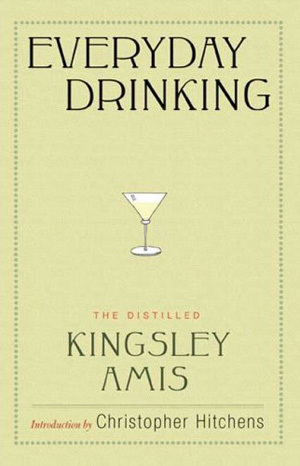 Potentially the most charming section of Everyday Drinking, Amis’ chapter on hangovers offers a few conventional correctives — hair of the dog, light breakfast, hot shower — but the real treat is his spirited, loving attention paid to topic, one which he seems to regard as the inevitable outcome of a life lived fully. After dispensing with the physical effects, Amis advances a theory of the “metaphysical hangover” — the cocktail of gloom, despair and shame that accompanies the body’s suffering. Amis considers that Dostoevsky, Poe and Kafka metaphorically render the affliction best, especially Kafka in his The Metamorphosis: “The central image could hardly be better chosen, and there is a telling touch in the nasty way everybody goes on at the chap.” A “Hangover Reading Course” is designed to drop the reader rock bottom as, “A good cry is the initial aim.” His “Hangover Listening Course” recommends Tchaikovsky’s Sixth Symphony, Sibelius’ The Swan of Tuonela, and Brahms’ Alto Rhapsody, but warns readers to proceed carefully with jazz, since John Coltrane, “will suggest to you, in the strongest terms, that life is exactly what you are at present taking it to be: cheap, futile, and meaningless.” As is true for the entire volume, Amis’ actual pedagogy is often shoddy, entertaining at best, but the uncompromising bon vivant attitude underlying the presentation is priceless, especially in an age of didactic diets and immoderate moderation. Amis sets the terms of endearment early, declaring with deadpan faith that a team of American investigators had recently determined that without the societal underpinnings provided by alcohol, Western society would have collapsed around the end of World Word I. From here, Amis concludes, “The human race has not devised any way of dissolving barriers, getting to know the other chap fast, breaking the ice, that is one-tenth as handy and efficient as letting you and the other chap, or chaps, cease to be totally sober at about the same rate in agreeable surroundings.” Amis’ love for drink leads him to abuse the stingy and skewer the snobby, repeatedly stressing quantity over quality in all matters alcoholic. Nonetheless, the book’s funniest chapter by far is Amis’ Mean Sod’s Guide, a set of tricks constructed to screw guests while appearing to have flattered them, the ideal scenario producing, “a quarrel on the way home between husband and wife, he disparaging your hospitality, she saying you were very sweet and thoughtful and he is just a frustrated drunk.” Amis suggests serving punch in small glasses, mentioning that the recipe is your own invention and adding menacingly that it has more of a kick than might be expected. Pouring a thimbleful of gin on the back of a spoon over a glass will spike the first sip while leaving the rest of the drink discreetly weak. The cheap wine served with dinner will have been procured “on holiday” and the host will be “interested” in people’s reactions. When the reviews are less than thrilled, “announce bluffly, ‘Doesn’t travel, does it? Doesn’t travel.’ Judge your audience.” Amis ends with a sobering admission that if the reader finds this whole business to be a farce, he must not have been around much yet. The other jewel of the volume is the section on the Boozing Man’s Diet, formulated to cut weight while not reducing alcoholic intake by one ounce. Amis finds himself frustrated with typical diets, which always finish with the instruction, “of course” to stop drinking altogether. “Of course? No alcohol? What kind of people do they think we are?” A spartan course of grapefruit, soup, chicken, and no bread promises to keep the serious drinker in effete shape, though Amis concedes the fastest way to lose weight is in fact to really just quit drinking. But for how to go about this, Amis shrugs — abstinence is not his field. Should the reader come away from this book with the feeling that Amis was an overenthusiastic lush, lending excessive leeway to mere pleasure, Amis’ disciplined work schedule should be taken into account. He followed a daily regime producing 500 words every morning and wrote over 20 novels, three volumes of poetry and a legion of short stories and magazine columns in his lifetime. Though it is generally agreed that drink got Amis in the end, it may also be true that he was simply not a fellow to leave any glass half-empty.